Steamlights ProTac HPL is built with aircraft-grade aluminum and the latest LED technology. The new ProTac HPL is built with 6000 series machined aircraft-grade aluminum complete with an anodized finish for superior rust and corrosion resistance. This excellent body construction is IPX4 rated, providing up to 2 meters of drop resistance to failure or breakage. However, water resistance is only moderate, providing protection from “splashing water” only. Don’t expect to drop the HPL in a creek or pond and it to come out shining. The ProTac HPL is controlled from a multi-function, push-button tail switch at the end of the body. This tail switch is programmed with Streamlight’s TEN-TAP® programming, allowing users to personally customize how the light pattern will perform. This includes momentary, variable intensity, and strobe modes. Factory settings provide a high/strobe/low function, but users can program high only; or reverse the pattern to low/medium/high. 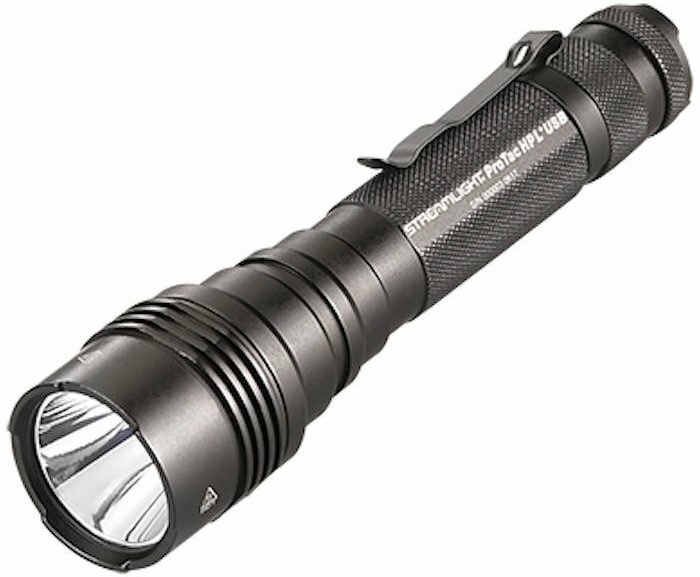 Using the latest LED technology, the top lumen rating for the ProTac HPL is a very powerful 1000 lumens on the high setting. This 1000 lumen beam produces 35,000 candela in a beam reaching out to a very impressive 374 meters (over 1200 feet)! Run time on the high setting is an incredible 1 hour 30 minutes. The medium setting produces a 400 lumen (14,100 candela) beam reaching out to 237 meters (over 750 feet) for (3) hours. Low setting provides a respectable 65 lumen (2,250 candela) beam out to 95 meters (over 300 feet) for 20 hours. A hidden USB port makes recharging the ProTac HPL very easy and convenient. The ProTac HPL offers a USB recharging port for the included 18650 lithium-ion battery, but can also be powered by (2) 3V CR123A lithium cell batteries should power run out in the field. The USB recharging port is located behind a sliding sleeve just behind the flashlight’s bezel. This provides excellent protection during field use, with easy access when charging is required. The ProTac HPL will ship with an included USB cord, Streamlight 18650 lithium-ion rechargeable battery, and a ballistic nylon holster. 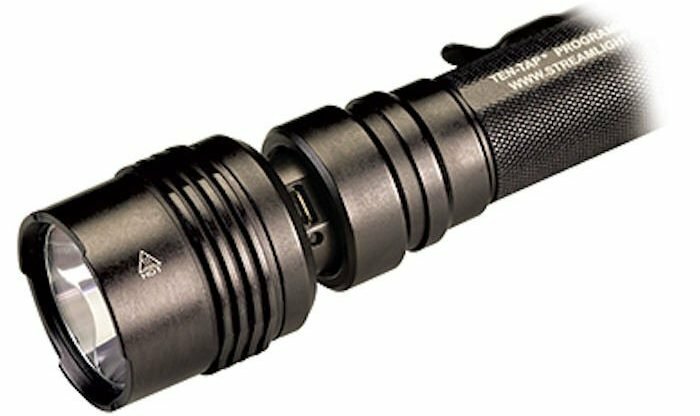 Streamlight offers a limited lifetime warrant on the ProTac HPL. MSRP: $180.00 to $200.00 depending on configuration. Another look at the USB port on the ProTac HPL, revealed from behind a sliding sleeve. The BlueSheepdog Crew have had very positive experiences with a wide variety of Streamlight flashlights. 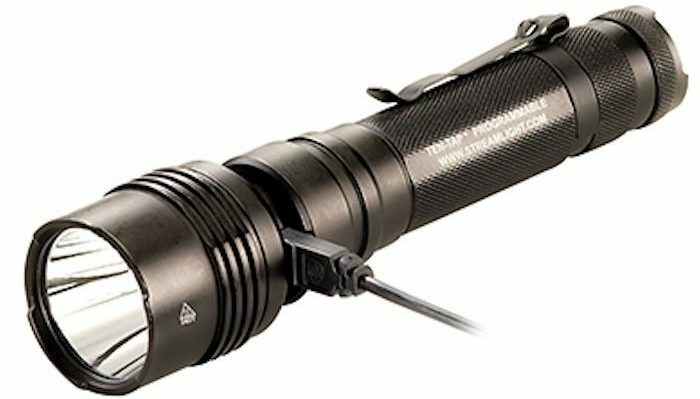 Most of us have carried a Streamlight on duty, including the old SL series (worthy replacements for the old metal MagLites). As flashlight technology improved we have used and experimented with the Stinger, Strion, PolyTac, and even other ProTac models. Each time we have been impressed and found the Streamlight’s trustworthy and duty ready. This new ProTac HPL offers excellent construction, top-line LED technology, and decent drop and water resistance. Though the 1000 lumen high output is fantastic, we always warn our readers about “flashback” with lights producing such powerful emissions. In fact, for interior work we would recommend officers use only the medium setting to avoid blinding your low-light vision should “flashback” occur. High beam or strobe could be used once a threat has been located and identified. Outside, however, the 750 foot 1000 lumen beam should be an enormous benefit in area searches. This looks to be another winner for Streamlight.